WELCOME TO INDIANAPOLIS CRYOTHERAPY AT TRUE FITNESS! If you’ve never tried our Indianapolis cryotherapy services, we invite you to come in and see for yourself why it’s the fastest growing spa treatment of choice in the United States! Used for decades in Europe, Whole Body Cryotherapy (WBC) has numerous health benefits, some of which include: decreased joint and muscle pain, increased energy and metabolism, faster recovery time, improved skin appearance and decreased inflammation. Our Indianapolis Cryotherapy services are safe, effective and affordable. Side effects are relatively nonexistent, and that’s why many people use it as an alternative to expensive doctor visits and medications for everyday aches and pains. Cryotherapy is simple (it only takes 3 minutes), but the body’s reaction is complex. When you step into the cryochamber, your body is surrounded by hyper cooled air. The skin’s thermoreceptors sense this dramatic temperature change and send a signal to the brain, causing a central nervous system response. Blood from the peripheral tissues is rushed to the body’s core. There, the blood is detoxified and supplied with fresh oxygen, enzymes, and nutrients. After the session, tissues and organs are replenished with this nutrient-rich blood. This has a healing effect, promoting internal organ regeneration and cell renewal. Cryotherapy uses your body’s natural response to the cold to enhance healing. During the process, your blood is rushed from the periphery to your core where it’s detoxified and enriched with oxygen and nutrients. After the treatment, this blood is returned to the extremities where it aids in cell rejuvenation and healing. The cryotherapy process works to detoxify your body and increase oxygen levels. This can help produce better, younger-looking skin. Cryotherapy can improve many chronic skin conditions and provide anti-aging benefits. In Europe, whole body cryotherapy has been used for decades by athletes to enhance performance and recover from injuries. Recently, people all over in the United States have started discovering the wonderful benefits of this safe and effective treatment. And you don’t need to be an elite athlete to use cryotherapy…… Anyone who is active, has aches and pains or wants to enhance their energy level can benefit! When I first started cryotherapy I was about 3 weeks post-op. I had double jaw surgery which left my face incredibly swollen. Since starting cryotherapy I have a seen a drastic reduction in swelling. At the 6-week post-op checkup, my surgeon told me my swelling is what he normally sees at about 3 months! He also noted that the nerves in my jaw were regenerating quicker than he had seen in his 35-year career. I am incredibly happy with what cryotherapy has done for me and surprised it took The States this long to get with the program! As a former collegiate and professional athlete, I’ve experienced multiple bumps, bruises, and surgeries. All of these things have left my joints stiff and aching. I recently began Cryotherapy at True Fitness, the results have been outstanding! My joint pain and stiffness has significantly subsided. These results have left me extremely optimistic; with continued treatment, I now know that my body can fully recover from the punishment of playing collegiate and professional football. – Marlin Jackson Founder/President of Fight For Life Foundation Inc. Dealing with a hip that has arthritis and little cartilage left, cryotherapy has really helped. I can tell the inflammation is reduced, sleeping better and decreasing soreness after exercising. Plus I can’t say enough about the amazing staff! I am training for my first full distance Ironman this year. 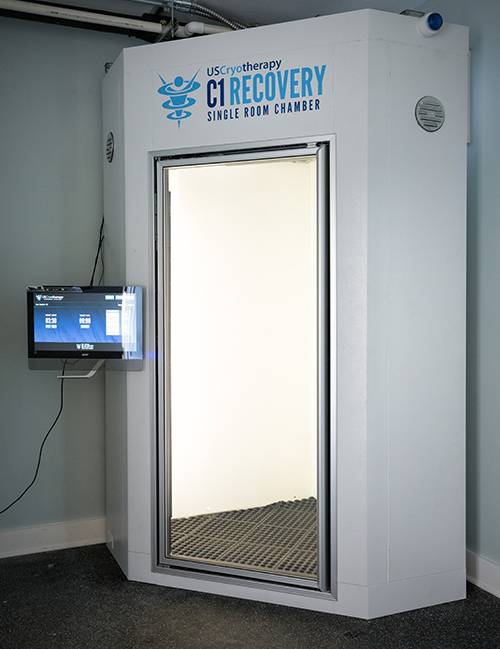 I have recently added cryotherapy for my recovery and it has been amazing. I will come in after a long hard run with tired and cramping legs and leave feeling full of energy and with fresh feeling legs. Karen and her staff at True Fitness have been so nice and helpful. And the best part is that it only takes 3 minutes!! My twelve year old son, A.J., was diagnosed with a severe case of mono. His doctors told us with how severe his mono levels were, that he wouldn’t be back to 100% for a year or more. Some of the problems he’s faced during the last 7 months have been: joint and muscle pain, low energy, headaches, low immune system and trouble fighting off infection. He’s gotten numerous cases of strep throat and/or sinus infections over the last 7 months. After researching Cryotherapy, I found it might be beneficial for him to try this type of therapy. He went 2 days in a row, and we found that he was sleeping better at night (his headaches and joint pain were causing him to have sleep deprivation). He told us his joints didn’t hurt as bad. We continued to go every day for the next few weeks. We did miss a weekend as we went to the lake. We found during our lake time that he had more energy and didn’t seem as restless. A.J. has now gone a total of 14 times, and the changes we’ve seen have been amazing. We see glimmers of our active, crazy, 12 year old boy coming back. We are so thankful that True Fitness offers Cryotherapy and that my son has been able to be a part of something that we feel is FINALLY helping him to feel better. His infectious disease doctor told us he has the Epstein-Barr Virus (EBV), and that we should expect things like joint pain and fatigue. We can honestly say he is improving because of Cryotherapy. Thank you True Fitness for offering such a wonderful service!